A chemically-etched titanium surface was modified by electrospinning a sol–gel-derived hydroxyapatite (HAp) that was subjected to calcination within the temperature range of 200–1400°C in the normative atmospheric condition. After heat treatment, crystal structures of the filmed titanium oxide and HAp on the titanium’s surface were identified using wide-angle X-ray diffraction. A highly porous layer of HAp was found to have formed on the oxidized titanium surfaces. The surfaces of three different samples; (1) electrospun HAp, (2) HAp calcined at 600°C, and (3) HAp calcined at 800°C, were investigated for their ability to foster promotion, proliferation, and differentiation of human osteoblasts (HOB) (in the 9th passage) in vitro up to 6 days. Among the three samples, cells cultured on the HAp calcined at 800°C titanium surfaces displayed the best results with regard to adhesion, growth, and proliferation of HOB. 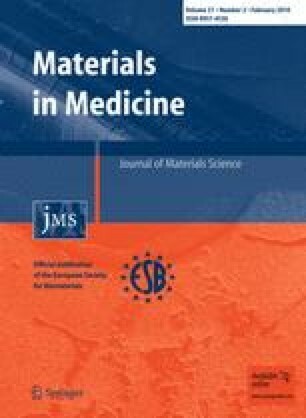 This novel method for fabrication of titanium substrates would provide a promising improvement for titanium-based medical devices over the current standards, which lack such substrates. These titanium substrates explicitly provide enhanced HOB proliferation in terms of both desired surface properties and their produced bulk quantity. This research was supported by the Korean Research Foundation (KRF2007-211-D00032, Korean Government Project No. 10028211), Grant Funded by the Korean Government (MOEHRD), and Regional Research Centers Program of the Korean Ministry of Educational and Human Resources Development through the Center for Healthcare Technology Development, Chonbuk National University, Jeonju 562-756, Republic of Korea.